Week 3 of half marathon training started better than week 2 finished off. After my second consecutive Sunday long run fail (only in the sense of performance, personally I had a great time) the evidence is pointing to cold induced breathing issues. Every run that I've done, either at temperatures above 40° or indoors, since my Brooklyn half training kickoff, has resulted in a decent performance. The two times I ran in high 20's/low 30's weather, I struggled mightily. Cold weather, J'accuse! Or it could be the hills. Either way, the fact that I'm running decently more often than not is keeping me hopeful. Spring is here so chances are that one of these upcoming Sundays will provide better weather. That may help me turn the corner on my weekend base runs. Today was speed day. It was 22° outside this morning, so I opted to do my workout indoors. Hal Higdon's program prescribed a 3.5 mile run, but I decided that I know a little more about this stuff than he does. But seriously, I've modified the Higdon training program to start my week with speed on Tuesdays and a base run on Wednesdays. 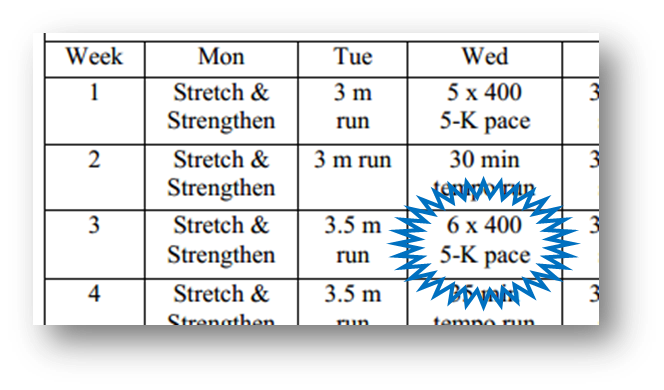 Hal puts speed work into the Wednesday slot and allocates only Sundays to long runs. 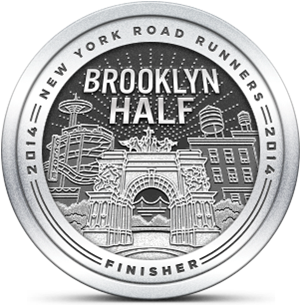 I felt I needed a little more base than that, an opinion echoed by some knowledgeable runners. Hal's speed workout is 6 x 400's at 5K pace (8:24) and that's what I did this morning. In between repeats, I did 240 meter recovery jogs (.15 miles), which I may cut down to .12 miles next time. I also did a half mile warm up and cool down. I normally would have run another mile at my usual training pace to make a full three, but today I decided that 1.5 miles of speed stood on its own. Tomorrow should be a 4.8 mile base/recovery run. The "feels like" temperature is predicted to be 19° when I plan to go out in the morning, so I'll have to decide whether to endure this cold and its effects, or suffer the tedium of a longish treadmill run. We're getting snow overnight, so that may help the decision. I'm SO happy that you had a great speed run today! Are the three us us going to do anything again this weekend - or should I plan my own training? I think the trick is knowing I can hit the breaks after every quarter. I'm aiming for 7 on Sunday and the easiest (well most straightforward) route for that is Bethpage. I know that "Deena" is running the King's Park 15K on Sat but probably would want to do a recovery on Sunday. I'd love to meet up, although I can't vouch for my ability to manage a better pace than last weekend yet. It looks like rain both days. Boo! Please talk to someone about moving the rain to next Monday. When I used to do speed work at the track, I would run 400 meters in between each sprint. So you would do one lap fast followed by a recovery lap? Do you remember your jogging pace?